Vocabulary building cryptolist puzzle to print. 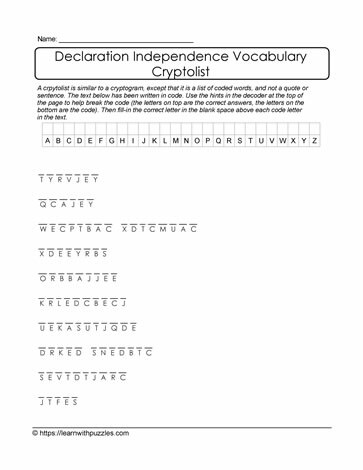 Declaration of Independence cryptolist puzzle to print. Challenging puzzle for family, friends and classmates. Suitable for students in middle grades 7,8,9 classrooms and students being home schooled. Students substitute one letter for another to decipher each word and then use the chart to record letter substitutions. This printable cryptolist puzzle supports and complements curriculum.